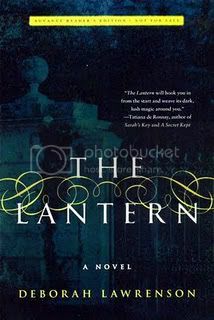 This week is the final installment of the readalong of Deborah Lawrenson’s “The Lantern,” hosted by Carl from Stainless Steel Droppings as a part of the R.eaders I.mbibing P.eril Challenge. This week’s questions were written by Heather. From this point onward, there will be spoilers. I’ll post a spoiler-free review later in the week for anyone who hasn’t been reading along. So last week, when Dom mentioned that Rachel had cancer, I speculated that there was a euthanasia situation. I wanted to like Dom, and was hoping that whatever it was that he did was morally questionable rather than flat-out evil. I was excited when I found out that I had guessed it! Overall, I enjoyed this book a lot. It was a bit lighter and more flowery than what I normally read, but the gothic feel and descriptions of Provence made the novel. It was far better than I expected. I’ve got some choice words to describe Rachel that I’m not going to post her. She’s a little *expletives deleted. * There are some things you just don’t do, and telling a guy you’re pregnant in order to manipulate him is one of them. I’ve liked Dom throughout the novel. Yes, he’s a wee bit angsty, but given that he put up with Rachel for so long, I can understand why he’s emotionally a wreck. Sabine’s a neighborly busybody who is at the same time very naive. If Rachel would have leveled with her instead of telling her fabricated stories or distortions of reality, then I don’t think she would have been so secretive throughout the book. He totally killed them. After what he did to Annette, he probably didn’t want her to tell anyone. If I saw what happened, he saw Marthe sitting there and a little push was all it took to get rid of her, then dealt with Annette. I could have believed their deaths to be accidental, except for the fact that he was there when they disappeared and he lied about Marthe being alive in order to get even with Benedicte. I haven’t read “Rebecca,” so I have no comment on this one. I’m going to answer this one with the next question. The only real problem that I had with this story is that there was no obvious way to tell who was speaking. Lawrenson should have either italicized Benedicte’s segments or titled each chapter with the name of the narrator. Either one would have made it much easier for the reader to picture who is speaking at any given time. Aside from that, I liked the two narrators, and I love the way that the stories all tied themselves together in the end. I think the fact that each of our narrators had a limited perspective made the story more believable, and it was nice to think of each of the characters as having their own motivations and limitations. I liked how we learned that Benedicte’s ghosts were a product of her limited sight, but at the same time Eve experiences Benedicte’s ghost flipping through an old childhood book. The one other thing that I’d like to mention is that I enjoyed the fact that there was no serial killer, but rather a lot of unrelated events that we assumed were tied together. It’s a giant red herring, and I appreciated it. I’m glad that Dom didn’t end up being completely evil or psychotic, but instead very human. Thanks for reading! Be sure to check out everyone else’s blog posts and responses! That’s right, you were the one who called the whole euthanasia thing. Well done you! That was brilliant. I never would have made those connections beforehand in a million years. I had a little thrill when I read on and found out you were right. And now it is time for you to pick my lotto numbers! I think you and I had pretty similar experiences with the book, and I’m actually excited you did given that you didn’t have a knowledge of Rebecca to fill in gaps for you like I did. I want to put in a MASSIVE plug for Rebecca. I hope you can read it fresh without thinking too much about this book. It certainly has its own differences and as much as I truly enjoyed this novel, Rebecca remains a far superior work of fiction. And it drips with suspense and atmosphere. Anyway, I also liked that the serial killer storyline was just a red herring. I do wish that she would have left it unresolved at the end as I think that would have left a cloud of suspicion over everything that would have been fun. I don’t think Lawrenson needed to so neatly tie up every loose end. But that is a minor complaint and as this is a debut novel I can be more easily forgiving of that. Dom annoyed me during the middle section of the book only because I was fighting that urge to expect him to “step up and be a man”, which I knew full well would not have worked at all for the story. I am happy that the two ended up together. I’m a ‘happily ever after’ romantic and I didn’t want Dom to be some murderous rogue because then I would have been furious if Eve chose to overlook that and just stay with him anyway. I think Pierre probably killed both of them, but I don’t have too much of a problem with the idea that he could have just attacked Annette again and Marthe died going to try to get help. Either way Pierre would have had to make the effort to bury them both and so again I consider him very guilty and I think his later actions all but screamed his guilt. I really enjoyed this book and am glad we had a good group discussing it. Even those who didn’t like it so much had great commentary. We’ll need to do this every year for R.I.P.! Hopefully we’ll all do another group read much sooner than that though. I’m definitely down for more group reads. They’re a lot of fun! I think I will have to read Rebecca at some point, although it may be a while because my copy is still at my parents’ house in Pennsylvania. Pierre is so evil. At the same time, I liked the added bit of complexity that was thrown in at the end when he faked his death for Benedicte. It makes me wonder whether he actually felt bad for her, or just didn’t want her to suspect that he had something to do with Marthe’s disappearance. Well done on the assisted suicide guess! I hadn’t seen that one particularly coming. Good job. I definitely think I’d like to do more group reads if there were groups reading books I wanted to read as well – this was a nice experience! Its been a nice mix. I know I’m going to host a group read of Foundation by Asimov in November. Not sure what else, but I’m hoping to be inspired by something else soon that would generate interesting discussion. I’m excited for the Asimov. I bought the book a few months ago and just haven’t gotten to it yet, so a group read of it would be perfect! Thanks! When I guessed it, I was like “No… I’m being way too imaginative, there’s no way she’ll do that, but I hope she does.” Was so excited to be right! You should definitely join us for more group reads! I have really enjoyed reading all the posts for this book. I probably should have waited until I had written my own post, but oh, well! I am glad that we did this as a read-along because it was fun to read all the different things that people felt worth talking about and the different opinions raised. It was. It’s interesting because I think a lot of people didn’t care for this book as much as I did this time. I love groupreads; the discussion is always amazing! Oh please, please do read Rebecca! It’s the ideal read for this time of year, and if you loved Lawrenson’s powers of descriptions in the slightest, you’ll go crazy for the Du Maurier original! I’m SO excited for more of Carl’s group reads, as these are the first I’ve done and the conversation has been not only eye-opening, but has challenged the way I read and review as part of the larger conversation surrounding a book! So great! I agree with you that, at least in the beginning, it was horribly frustrating to figure out who was speaking – not to mention confusing, as I spent most of the Part One read trying to figure out who was who, when was when, and all those other questions that come with alternating view-points. However, I thought that this got less and less annoying as the separate plots developed in to themselves and there was enough information to differentiate the two on. My only other wish would have been to see more Pierre – I know he was dark and twisty and the evilest of evils, but he was still fascinating! I got a lovely email from the author today and am in conversation with her about possibly getting involved in discourse with us OR at least allowing me to share her email to me. One of the things she shared is that she actually advocated for a difference in font or some visual cue for each narrator and the publisher shot that idea down. Ooooh, interesting! I wish the publisher hadn’t shot that down, because I think it would have made a big difference when reading. Awesome. The descriptions were one of the things I loved most about the novel. I’m glad you’ll be joining us for more group reads! I love the discussions. Normally I read things that most of my friends have never even heard of, so it’s amazing to be able to discuss it with other bloggers who may have different opinions than my own! It did get easier to differentiate the narrators as the book went on and we began to learn a bit more about each, but it was somewhat frustrating at first, as it would take a few paragraphs at least to figure out who was talking in each paragraph. Pierre was so evil. I love the way that the author described his childhood pathologies to us first, and the way he treated poor kitties. I think that says so much more about him than just showing him as an adult would have. You simply must read Rebecca! I think that although I enjoyed this book, part of the reason why some parts disagreed with me were because I just read Rebecca a few weeks ago, but I think if you read it now, you’d enjoy it even more. Good point on Rachel being just an evil person – who tells a guy they’re pregnant when they’re not and they know it? Ugh. But, I kept thinking that maybe I didn’t know the whole story even though Dom was telling it, because I still didn’t trust Dom. I’m planning on reading Rebecca eventually. Rachel reminded me of the Schuester’s ex-wife on Glee.